The boom in the web has given Domain Investors a great scope to earn monies by registering various domain names and then selling them to buyers who would like to set up their businesses. Although .com TLD is the most popular one, it is also the most saturated. Every common name with a .com TLD is already registered. And so is the case with all the other popular TLDs. With a scenario like this, the task of Domain Investors has become much more difficult. Concentrate on a particular industry or an idea that interests you and focus completely on that. Follow what’s happening in that industry, latest news, trends, future forecasts, changes etc. This can help you purchase or even create domain names with much more understanding of your buyer’s need. Concentrated domain buying by understanding the market forces can have better returns than investing in domains across industries without actually knowing what’s happening. Choosing words that describe a product can be a great investment. Try and think of the new emerging products and buy them before they become popular. Creating domain names specific to a particular profession like lawyers etc., especially upcoming professions, can be a valuable asset. Combining products and service names with country names in creative ways can be a great idea. These are in great demand by businesses that are centered on the offering. Buying domain names for upcoming huge events like Olympics, FIFA etc. can be an assured catch, which can be sold off to the event organizers or other businesses working in conjunction with it. Is it simple & memorable? Does it have the business keywords? .com was and still remains the most popular TLD for website owners. It is a low-risk investment with the highest average sale in the secondary market. Though most .com domains are already sold and are reselling at a higher price, it is always a good idea to have some in your kitty. But do avoid long and complicated names. Also, there are still plenty of opportunities to invest in and profit from; you just need to think out of the box. Previously registered domain names that have recently expired can be a great investment opportunity. Sometimes individuals & businesses register domains and no longer need them. WhoisXmlApi provides a daily list of Recently Expired Domains so that you can find such domains on time and register your preferred choices before others. Also through Whois data keep a track of domains that you are eyeing for and note its expiration date so incase it’s not renewed by the owner you can grab it way before anyone knows about it. New gTLDs have made an impact in the domain industry and will continue to do so in 2017, as there are considerable opportunities to locate a TLD that fits a business niche and identity. Businesses and individuals are now leveraging these new gTLDs in order to connect with their target audiences. The wealth of these new gTLDs means that companies can find a domain name that more closely resembles their industry, product, cause and brand. Though there is still some skepticism over this emerging trend, but carefully thought through TLDs can be a huge asset. 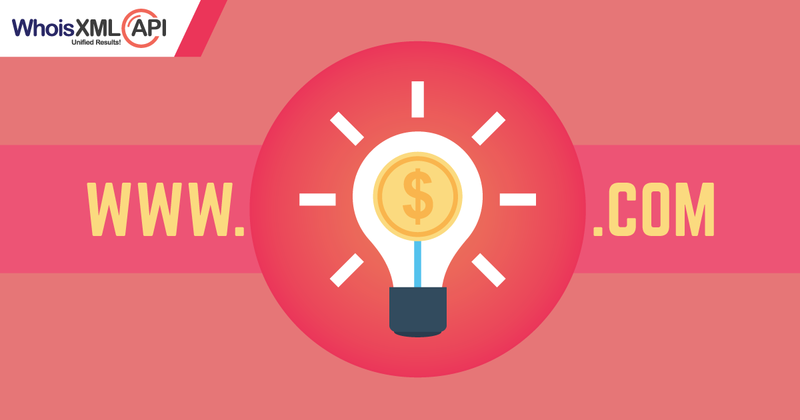 If there’s a new TLD that would be shorter, it could be more valuable than a longer .com. Do keep watching this space for more tips and tricks specific to domain industry. Until then do invest wisely!